Water is one of the earth’s scarce resources, and as populations grow, there will be increasing pressure placed on these resources. Water remains the most effective means of flushing waste down a modern toilet. Governments are putting pressure on manufacturers to reduce the amount of water used in the toilets that they produce, and they have responded with new and more efficient flushing technology, while still managing to reduce the volume of water required. We’ve reviewed some of these toilets below. As pressure mounts to reduce water consumption, governments will respond by increasing taxes or prices per gallon. For the buyer who is looking for a replacement toilet, a new water-efficient toilet may be worth considering. It has a high-profile tank and an elongated bowl constructed from vitreous china. It is available in white. It utilizes a lever to flush—so it is just like any other toilet, it just offers two different flush options to choose from. This toilet is highly effective thanks to its Siphonic dual flush system that offers a 0.91 GPF partial flush rate and a 1.28 full flush rate. It features the G-Max flushing system which allows it to offer a powerful fast flush each and every time. It features a 16 GPF (gallons per flush) rating thanks to its G-max siphon jet flushing system. This toilet has a 2-inch flush valve, which allows it to effectively get the entire bowl every time you flush. If you are looking for one of the most affordable water saving toilets, then this is definitely a great one to consider! The Niagra Stealth is a two-piece toilet that offers a 0.8 GPF (gallons per flush) rating and is ADA compliant. So, not only will this toilet help you reduce your water bill and carbon footprint—but it is also great option if you live with any children or disabled individuals. This toilet features an elongated bowl, for additional comfort—however, since it is an elongated bowl you will need to make sure it fits in your bathroom space (sometimes these bowls are not compatible with smaller bathroom spaces). It is made of vitrous china, which makes it really durable, and since it is white it will look great in any bathroom. Keep in mind that this toilet’s WaterSense certification makes it incredibly efficient without sacrificing performance. In fact, this toilet has a pressure-assisted flush system that makes it incredibly powerful and effective. It also features quiet flush technology—so you don’t have to worry about waking anyone up when you use the bathroom in the middle of the night. Overall, this toilet comes at a great price—although you will have to purchase the seat separately (make sure it is compatible with an elongated bowl when you do). It is easy to install and since it is a two-piece toilet shipping will be much more affordable—although the bowl and the tank may arrive separately. In the end, this is definitely one of the best water saving toilet models out there! If you are looking for one of the best low flow toilets this Kohler model is a great way to go. Not only does it come at a pretty great price, but its water saving capabilities and two-piece design offer tons of beneficial features that are worth a look! This toilet features a dual flush system—so you always have the option to choose between a partial flush and full flush as needed. The partial flush option offers a 1.1 GPF (gallons per flush) rating while the full flush offers a 1.6 GPF rating. It utilizes a lever to flush—so it is just like any other toilet, it just offers two different flush options to choose from. Another great feature this toilet offers is its elongated toilet bowl design, which offers more space to sit on. However, make sure to measure your space—especially if you have a smaller bathroom space—to ensure that an elongated toilet bowl will fit in your bathroom. This toilet features a traditional design and if want to upgrade the tank later on you have the option to do so. In the end, this is a great toilet to consider for your home. It is capable of reducing your toilet’s water usage by up to 30 percent—which reduce your water bill as well as benefit the environment in the long run. Make sure to take a closer look at this one—it is effective, efficient and reliable. Finding the best low flow toilets is a difficult feat—and finding one at a great price is even harder. The American Standard H2Option toilet is not only affordable but it is also one of the most effective water saving toilets out there. It is a two-piece toilet that definitely deserves a further look. This toilet is highly effective thanks to its Siphonic dual flush system that offers a 0.91 GPF partial flush rate and a 1.28 full flush rate. This gallons per flush rating makes this toilet WaterSense certified and demonstrates how efficient and water conserving it truly is. The toilet also features Ever Clean surface and a PowerWash rim which, combined with the Siphonic system, makes the toilet easy to clean—and helps it stay clean longer. As far as comfort, this toilet also features an elongated toilet bowl design—although you will have to purchase the toilet seat separately. It meets the standard height requirement—so, if you are looking for an ADA compliant toilet this one will not fit the bill. The push button on the top of the toilet is chrome plated and easy to use, so if you are tired of the traditional lever system you will love this toilet. Overall, this is a great toilet that comes at a great price. The company offers a limited lifetime warranty that will cover certain incidentals—which is a great option to have for those “just in case scenarios.” This toilet also prevents bacteria build-up and its dual flush Siphonic jet system is both powerful and effective! Toto is known for producing some of the best water saving toilet models out there—and it is also one of the brand’s more cost-effective selections. It is a two-piece toilet that features an elongated toilet bowl design for additional comfort. The Toto Drake toilet offers a 1.6 GPF (gallons per flush) rating. It features the G-Max flushing system which allows it to offer a powerful fast flush each and every time. Toto also managed to ensure the toilet has a quiet flushing system—so you don’t have to worry about waking up those light sleepers in your home. The siphon jet flushing system helps keep your toilet cleaner longer and covers every inch of the bowl every single time that you flush. Another great feature this toilet offers is its SanaGloss surface—which makes the toilet only look great but also a lot easier to clean (and stay clean). It is important to note, however, that toilet seat needs to be purchased separately, so make sure to get an elongated model. Overall, this toilet comes at a great price and since it is a two-piece toilet each part may end up getting shipped separately. However, it is designed to look great in almost any bathroom and if you get a SoftClose seat you will have a toilet that is virtually silent when ever you use it since it also has a quiet flush system. Here we have another Toto toilet on our list and while it is more expensive than some of the other options on our list, it is worth every penny if your budget allows for it. Unlike most of the selections on our list, this is a one-piece toilet—which means it features a sleeker and easier to clean design. It also offer four different colors to choose from—Bone, Colonial White, Cotton White, and Sedona Beige—which means you will have more options to choose form to ensure you get the perfect fit for your bathroom. When it comes to water saving capabilities, this Toto toilet is one of the best. It features a 16 GPF (gallons per flush) rating thanks to its G-max siphon jet flushing system. It is quiet, powerful, and effective—so you get a strong flush every single time without having to worry about waking up anyone in the house. The G-Max system also allows the toilet to draw in the water much faster and with more power, which also helps keep the toilet cleaner longer. When it comes to comfort, this toilet is one of the best since it features an elongated bowl design. And, unlike some of the other toilet selections on our list, this Toto toilet comes with the seat included. The best part is that the toilet features a SoftClose hinge system—which allows this toilet to be virtually silent since it also features a quiet flush system. Another great feature offered by this toilet is that it easy to clean. This is because it has a SanaGloss ion barrier which prevent bacteria and dirt from building up. Since it is a one-piece toilet it is also a lot easier to get to when you clean the toilet. To summarize, this is an excellent toilet to consider. While it is on the pricier side, if your budget allows for it, then it is an excellent toilet to invest in. It features silencing options that make it quiet when you use it and its water saving features will reduce your water bill! 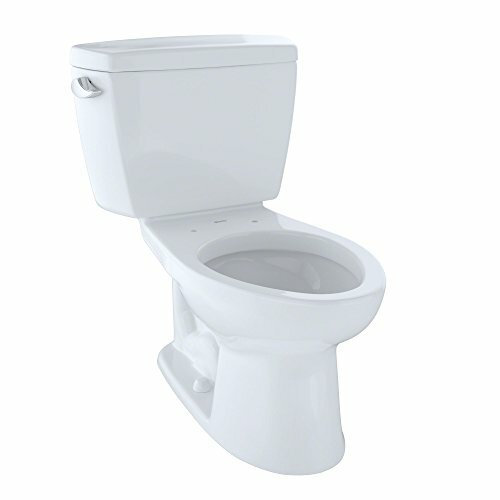 If you are on the hunt for a water saving toilet, you can’t go wrong with the American Standard toilet. This is one of the best brand’s out there, and this toilet definitely does it justice—it is effective, efficient, and incredibly reliable. If you want a toilet that will fit your bathroom perfectly, you will love that it is available in both white and linen colors to choose from. First and foremost, this toilet features a 1.6 GPF (gallons per flush) rating—making it a great water conservative option to choose from. This toilet has a 2-inch flush valve, which allows it to effectively get the entire bowl every time you flush. The trapway on this one-piece toilet can also handle 70% more than your standard toilet, making it a great option for those of you who have larger households and want to prevent as many clogs as possible. This toilet is also a one-piece toilet, which means it features a sleek and easy to clean design that will look great in almost any bathroom. Its elongated toilet bowl makes it really comfortable—just make sure to get a toilet seat designed for an elongated toilet bowl since you have to purchase it separately. Since this one is also ADA compliant, it is a perfect option for those of you with children or disabled family members as well! While this toilet is on the pricier side, it also offers a ten-year warranty that will cover almost everything as long as you own the toilet. Since it has an EverClean surface it will prevent any bacteria or odor from forming—so on top of being able to clean it will also stay cleaner longer. Toto is one of the most innovative and eco-friendly brands out there—which is why we have several of their toilets on our list of the best water saving toilets. This one definitely one of the priciest selections we have featured here, but it is also one of the best options currently available on the market if you are looking for something that effectively conserves water without sacrificing power. This toilet features a double cyclone flushing system that only uses 1.28 gallons per flush! The double cyclone flushing system, like the name suggests, uses the power of gravity to get to every nook and cranny of your toilet bowl. The toilet is also built with vitreous china and chrome plated sanagloss to prevent any bacteria or odor build-up. space. It also features a SoftClose seat, so you don’t have to worry about waking anyone up during the night or having to deal with your toilet seat slamming down. And, if you want something that fits your bathroom décor scheme perfectly, you will love that this toilet is also available in three different colors to choose from—Sedona beige, Colonial white, and Bone. Overall, this is one of the best water-saving toilets out there. Not only does it have a low GPF rating, but it is also ADA compliant, making it perfect for your kids, elderly family members, and individuals with disabilities. This I one of the most durable and high-quality toilets out there, and it is worth every penny if your budget allows for it. The Kohler Santa Rosa toilet is another great water saving option from this brand. This toilet also features a seamless one-piece design that is easy to clean and will look great in almost any bathroom. Its elongated toilet bowl design also makes it a really comfortable one to use—in contrast to most elongate toilets, however, this one is compact in size. When it comes water conservation, this toilet is amazing! It offers a 1.28 GPF (gallons per flush) rating thanks to its AquaPiston Flush technology. This flushing system makes this toilet powerful without sacrificing efficiency—so you can count on it to get the job done at the end of the day. This toilet is also a comfort height toilet—so it makes it easier to use by people who have difficulty with standard height toilets. If you are worried about getting a toilet that may not match your bathrooms décor, then you will like the fact that this one is available in Kohler color palette options. Overall, if you want a great toilet that is comfortable and compact, then this is one of the best water-saving options to consider. Not only does it come at a great price, but it also comes with the toilet and lid as well—although you will have to purchase the supply line separately. This very expensive, single-piece toilet has all the features that a buyer could imagine and then some. The unit has a skirted bowl with a smooth finish, so it is very easy to keep clean and sanitized. It is available in cotton white. The bowl is protected by the patented SanaGloss glaze, which is an ionized, high-gloss barrier that repels particles, bacteria and mold, reducing the need for cleaning and ensuring that the finish retains its color and gloss. This product is ADA compliant. This unit boasts a dual-flush system that combines the double cyclone flushing system and jet flushing system. This combination is super-efficient, using between 0.8 and 1 GPF. The system uses two nozzles that can powerfully spray water into the bowl creating centrifugal force, which evacuates the toilet leaving the bowl sparkling clean. The toilet also sports Electrolyzed water technology, which ensures that the water stays clean between flushes. The flush is hands-free, operated by a remote control. The toilet determines the size of the flush. The toilet comes with a SoftClose seat, which can be heated and has a temperature control. The lid automatically rises and closes as the toilet is approached, and can be operated by a sensor or remote control. The seat incorporates a Washlet with aerated spray. The WonderWave sprayer and air dryer technology can be programmed for both water pressure and temperature, and personal selections can be retained in a two-person memory. The dryer temperature can also be programmed. The toilet has a deodorizer and a night-light. There is a three-year limited warranty for residential use and one-year for commercial use. Here we have another excellent selection from the Toto brand. The Toto Aquia is available in five different colors to choose from—Bone, Colonial White, Cotton, Ebony, and Sedona Beige—which gives you more options to choose from, so you find the perfect toilet to match the décor scheme in your bathroom. As far as water conservation, this is what Toto does best–after all, the brand strives to continually produce eco-friendly and innovative toilets. This one in particular features a dual flush system that delivers a 0.9 GPF (gallons per flush) rating when you use the partial flush and a 1.6 GPF rating when using the full flush setting. The dual flush setting is controlled by a sleek and easy to use chrome push button located at the top of the tank. Overall, with this toilet you are getting an easy to clean, sleek toilet that that will conserve water and help you lower your water bill while also helping the environment. Its elongated toilet bowl design is super comfortable and while you have to purchase the toilet seat separately, all of the Toto seats are compatible. Now that you have taken a look at our list of reviews, we encourage you to take a close look at our buying guide as well! Here we will cover several factors that you should definitely consider before making your final decision as well as discuss some commonly asked questions that you may have. If you want to make sure you get the perfect toilet for your household it is important that you take the time to cover all of the basis. The last thing you want to do is end up with a toilet you hate and will want to replace—or worst, get stuck with until you can afford to buy another one! If you take your time from the start you will be much happier in the long run! Our list of best water saving toilet reviews features several Toto toilets—and how could it not?! Toto is a well-renowned brand that is known for their focus on innovative and eco-friendly toilets that are designed to conserve water and protect our environment from over water usage. Some high-end Toto toilets are on the high-end of the cost spectrum—but if your budget allows for it their smart toilets are totally worth it. These Smart toilets offer additional features that conserve water and give you more comfort features to choose from—like seat and water temperature control, water pressure control, automatic flush system, sensor- controlled seats, and so much more. If you can’t afford the Toto smart toilets, however, but still want a Toto toilet don’t worry—the Toto brand offers more affordable options that can fit a lot of budgets. All of their toilets are eco friendly and conserve water, although some conserve more than others. Since they offer so many great selections, it is pretty easy to find a Toto toilet that offers the flush rating that you are looking for as well as fits the budget you set for yourself. Kohler is one of the most well-known American brands out there, so chances are you have already come across quite a bit of Kohler toilets already. This brand is one of the best ones to consider—and one that you can definitely trust. If you want a toilet that looks great offers options for all budgets, and is both reliable and efficient then this one is definitely a great one to go with. The Kohler toilets on our list are excellent water saving toilets that stay true to the Kohler brand’s standards. Not only are they some of the best water conserving toilet options, they are actually among the top options on the market today. They feature Kohler’s powerful flush systems and their toilets always include the brand’s newest innovative technologies. At the end of the day no matter what your budget is with Kohler you will get a toilet that maintains its quality and durability—no matter how expensive or cost-effective the model you are looking for is. American Standard is another excellent U.S. brand that has been around for almost a century and a half. They are known for their high-quality products, and their toilets are one of them. If you want to get a toilet from a brand you can trust, then American Standard is the way to go. Their toilets are not only innovative, but the brand strives to produce toilets for households, hotels, businesses, and even stadiums—so most people have used an American Standard toilet at some point in their life. American Standard is a leading brand not just in the toilet market, and all of their products are held to the same standard. Regardless of your budget, American Standard has toilets that will work for anyone. If you can afford the pricier options you will love all of their additional innovative features, but if you can’t afford their priciest toilets you will still get the same level of quality and effectiveness if you go with one of their more cost-effective toilets. You may have noticed we have toilet selections from Niagara on our list, but it is possible that you may have never heard of this brand or maybe you just have heard of It vaguely. Niagara isn’t a brand that started because they wanted to sell toilets, but rather because cared for the environment and wanted to make products that helped consumers save water without sacrificing the standard they are used to. produce products raised the bar when it comes to water conservation. With the technology we have today, there is really no point to have toilets that waste as much water as some of them do—and Niagara definitely sets out to stay up to date in everything they can do to make the most water conserving toilets. So, while this brand has been around for a little under half of a century, it is definitely one of the best when it comes to water conservation. They focus on eco-friendly products and we encourage you to check out all of the other products they have if you are serious about water conservation. While reading through our reviews you may have come across the WaterSense Certification—and you may have noticed that not all toilets have this. The WaterSense program was designed by the EPA back in 2006 to encourage companies and consumers to choose more water conserving toilets. Since toilets use the most amount of water when it comes to household water usage, which is why the WaterSense certification is a great thing to look out for when shopping for a water saving toilet. Currently, federal guidelines require toilets to adhere to a 1.6 gallons per flush standard—but toilets can conserve so much more water than that. In fact, for a toilet to gain the WaterSense certification, the toilet must adhere to a 1.28 gallons per flush standard—which, as you can see, is significantly lower than the federal standard. Some toilets with WaterSense certifications have even lower flush ratings—so 1.28 gallons per flush is not the best you can do! Either way, if you get a toilet with the WaterSense certification you will definitely be getting a toilet that saves water, helps you do your part to protect the environment, and even lowers your water bill so you end up saving money as well. While reading our page, you have encountered the term flush ratings quite a bit—and we just went over it a bit while discussing the WaterSense certification. When looking for any new toilet you should always take a look at its flush rating before making your final decision. The standard toilet uses 1.6 gallons per flush so overall you know that the toilet you are getting will offer that. However, if you are moving into an older home it is possible that your toilet may have a less efficient rating. At the end of the day, the lower the flush rating, the less water the toilet uses. So, if you want a water saving toilet, just make sure you get a toilet with a low flush rating. Are dual-flush systems worth it? Dual flushing toilets have quickly become popular since they offer both a partial flush and full flush option. You will notice we have several dual flush toilets in our list of reviews, and they are definitely great water saving toilets to consider. The partial system can use as little as little as 0.8 gallons per flush and is perfect for flushing liquids. The partial flush is not only efficient, but it is still powerful and effective enough to get the entire toilet and ensure that you don’t have to use the full flush in place of the partial flush. On the other hand, the full flush uses more water (any where from 1 gallon per flush to 1.6 gallons per flush) and is designed to flush solids. It is more power and uses more water since it has to flush more—but it still saves water over time. At the end of the day, the combination of the partial and full flush used by the dual flush system toilets makes these a great option for those of you looking for a great water saving toilet. This is a great way to cut down your water usage and even reduce your water bill over time. Are water saving toilets powerful? As you can see from our reviews and our buying guide, water saving toilets are just as powerful as standard toilets. Not only are they efficient, but they have come a long way from the standard toilets back in the day. In fact, you may even remember having to flush your toilet more than once when the 1.6 gallons per flush standard was first enacted because flush systems where not as effective as they are now. So, are water saving toilets actually powerful nowadays? Yes, they absolutely are! The flush systems the best water saving toilets ensure that they can effectively flush your toilet while also using less water then what is federally required. Toto has several flush systems that are specifically designed to ensure that they deliver a powerful flush every single time. Their Tornado flush system, which you may have read in our reviews, is an incredibly efficient flush system that uses a cyclonic action (like the name suggests) to cover every nook and cranny of your toilet. This not only allows it to be powerful, but also ensures that your toilets stays clean longer. Other pressure-assisted, and even gravity feed, flush systems are equally as efficient. The brand’s that make water saving toilet options stay up to date on the latest tech and ensure they are always coming up with more innovative designs. This is what allows them to produces such water saving models that come highly rated by real life users. Toilet manufacturers have come a long way to reduce the water usage of toilets, and in doing so, they have also improved the flush systems so that toilets look good, clean and sanitary, and no longer have problems with clogging. With so many different designs to choose from we hope that these reviews will help you choose a toilet that suits your lifestyle and household.